A digital cranial endocast of the Miocene platypus Obdurodon dicksoni was extracted from high- resolution X-ray computed tomography scans. This endocast represents the oldest from an unequivocal member of either extant monotreme lineage and is therefore important for inferring character support for Monotremata, a clade that is not well-diagnosed. We describe the Obdurodon endocast with reference to endocasts extracted from skulls of the three species of extant monotremes, particularly Ornithorhynchus anatinus, the duckbill platypus. We consulted published descriptions and illustrations of whole and sectioned brains of monotremes to determine which external features of the nervous system are represented on the endocasts. Similar to Ornithorhynchus, well-developed parafloccular casts and reduced olfactory bulb casts are present in the Obdurodon endocast. Reduction of the olfactory bulbs in comparison with tachyglossids and therian mammals is a potential apomorphy for Ornithorhynchidae. The trigeminal nuclei, ganglia, and nerves (i.e., trigeminal complex) are enlarged in Obdurodon as evidenced by their casts on the endocast; as is the case in the extant platypus. The visibility of enlarged trigeminal nucleus casts on the endocasts of Obdurodon and Ornithorhynchus is a possible synapomorphy of Ornithorhynchidae. Electroreception and enlargement of the trigeminal complex are possible synapomorphies for Monotremata. This specimen was collected from the middle Miocene Ringtail Site on the Riversleigh World Heritage property in Queensland, Australia. It was made available to the University of Texas High-Resolution X-ray CT Facility for scanning by Dr. Michael Archer of the University of New South Wales. Funding for scanning was provided by Dr. Archer. The specimen was scanned by Richard Ketcham on 12-13 November 1998 along the coronal axis for a total of 612 512x512 pixel slices. Each slice is 0.26 mm thick, with an interslice spacing of 0.22 mm (for a slice overlap of 0.04 mm) and a field of reconstruction of 53 mm. Abbie AA. 1934. The brain-stem and cerebellum of Echidna aculeata. Philosophic Trans R Soc Lond B 224:1-74. Andres KH, von Düring M. 1988. Comparative anatomy of vertebrate electroreceptors. In: Hamann W, Iggo A, editors. Transduction and cellular mechanisms in sensory receptors. Progress in Brain Research, Vol. 74. New York: Elsevier. p 113-131. Archer M, Flannery TF, Ritchie A, Molnar RE. 1985. First Mesozoic mammal from Australia--an early Cretaceous monotreme. Nature 318:363-363. Archer M, Jenkins FA, Hand SJ, Murray P, Godthelp H. 1992. Description of the skull and non-vestigial dentition of a Miocene platypus (Obdurodon dicksoni n. sp.) from Riversleigh, Australia, and the problem of monotreme origins. In: Augee ML, editor. Platypus and echidnas. Mosman, NSW, Australia: Royal Zoological Society of New South Wales. p 15-27. Archer M, Murray P, Hand SJ, Godthelp H. 1993. Reconsideration of monotreme relationships based on the skull and dentition of the Miocene Obdurodon dicksoni. In: Szalay FS, Novacek MJ, McKenna MC, editors. Mammal Phylogeny. Volume 1: Mesozoic differentiation, multituberculates, monotremes, early therians, and marsupials. New York: Springer-Verlag. p 75-94. Augee ML, Gooden BA. 1992. Evidence for electroreception from field studies of the echidna, Tachyglossus aculeatus. In: Augee ML, editor. Platypus and echidnas. Mosman, NSW, Australia: Royal Zoological Society of New South Wales. p 211-215. Ax P. 1987. The phylogenetic system: the systematization of organisms on the basis of their phylogenesis. Chichester, New York: John Wiley and Sons. 340 p.
Bohringer RC. 1992. The platypus bill receptors and their central connections. In: Augee ML, editor. Platypus and echidnas. Mosman, NSW, Australia: Royal Zoological Society of New South Wales. p 194-203. Brauer K, Schober W. 1970. Katalog der Säugetiergehirne. Jena: Veb Gustav Fischer Verlag. 150 p.
Brochu CA. 2000. A digitally-rendered endocast for Tyrannosaurus rex. J Vertebr Paleontol 20:1-6. Bullock TH, Bodznick DA, Northcutt RG. 1983. The phylogenetic distribution of electroreception: evidence for convergent evolution of a primitive vertebrate sense modality. Brain Res Rev 6:25-46. Butler AB, Hodos W. 1996. Comparative vertebrate neuroanatomy: evolution and adaptation. New York: Wiley-Liss. 514 p.
Catania KC. 2000. Epidermal sensory organs of moles, shrew-moles, and desmans: a study of the family Talpidae with comments on the function and evolution of Eimer’s organ. Brain Behav Evol 56:146-174. Colbert MW, Racicot R, Rowe T. 2005. Anatomy of the cranial endocast of the bottlenose dolphin Tursiops truncatus, based on HRXCT. J Mammal Evol 12:195-207. Denison C, Carlson WD, Ketcham RA. 1997. Three-dimensional quantitative textural analysis of metamorphic rocks using high-resolution computed X-ray tomography: Part I. Methods and techniques. J Metamorph Geol 15:29-44. Eisenberg JF. 1981. The mammalian radiations. Chicago: University of Chicago Press. 610 p.
Feng AS. 1991. Electric organs and electroreceptors. In: Prosser CL, editor. Neural and integrative animal physiology. New York: Wiley-Liss. p. 317-334. Franzosa JW, Rowe T. 2005. Cranial endocast of the Cretaceous theropod dinosaur Acrocanthosaurus atokensis. J Vertebr Paleontol 25:859-864. Fritzsch B, Münz H. 1986. Electroreception in amphibians. In: Bullock TH, Heiligenberg W, editors. Electroreception. New York: John Wiley and Sons, Inc. p. 483-496. Gould E, McShea W, Grand T. 1993. Function of the star in the star-nosed mole, Condylura cristata. J Mammal 74:108-116. Gregory WK. 1947. The monotremes and the palimpsest theory. Bull Am Mus Nat Hist 88:1-52. Griffiths M. 1968. Echidnas. New York: Pergamon Press. 282 p.
Griffiths M. 1978. The biology of the monotremes. New York: Academic Press. 367 p.
Hines M. 1929. The brain of Ornithorhynchus anatinus. Philosophic Trans R Soc Lond B 217:155-287. Huber E. 1930. Evolution of facial musculature and cutaneous field of trigeminus. Part I. Q Rev Biol 5:133-188. Jerison HJ. 1973. Evolution of the brain and intelligence. New York: Academic Press. 482 p.
Johnson JI, Switzer RC, Kirsch JAW. 1982a. Phylogeny through brain traits: fifteen characters which adumbrate mammalian genealogy. Brain Behav Evol 20:72-83. Johnson JI, Switzer RC, Kirsch JAW. 1982b. Phylogeny through brain traits: the distribution of categorizing characters in contemporary mammals. Brain Behav Evol 20:97-117. Johnson JI, Kirsch JAW, Reep RL, Switzer RC. 1994. Phylogeny through brain traits: more characters for the analysis of mammalian evolution. Brain Behav Evol 43:319-347. Kielan-Jaworowska Z. 1986. Brain evolution in Mesozoic mammals. In: Flanagan KM, Lillegraven JA, editors. Vertebrates, phylogeny, and philosophy. Contributions to Geology, Special Paper 3. Laramie: University of Wyoming. p 21-34. Kielan-Jaworowska Z, Cifelli RL, Luo Z-X. 2004. Mammals from the age of dinosaurs: origin, evolution, and structure. New York: Columbia University Press. 630 p.
Kirsch JAW. 1983. Phylogeny through brain traits: objectives and method. Brain Behav Evol 22:53-59. Kirsch JAW, Johnson JI. 1983. Phylogeny through brain traits: trees generated by neural characters. Brain Behav Evol 22:60-69. Kirsch JAW, Johnson JI, Switzer RC. 1983. Phylogeny through brain traits: the mammalian family tree. Brain Behav Evol 22:70-74. Krause DW, Kielan-Jaworowska Z. 1993. The endocranial cast and encephalization quotient of Ptilodus (Multituberculata, Mammalia). Palaeovertebrata 22:99-112. Kuhn H-J. 1971. Die Entwicklung und Morphologie des Schädels von Tachyglossus aculeatus. Abh d senck naturf Ges 528:1-224. Loo YT. 1930. The forebrain of the opossum, Didelphis virginiana. J Comp Neurol 51:13-64. Luo Z-X, Cifelli RL, Kielan-Jaworowska Z. 2001. Dual origin of tribosphenic mammals. Nature 409:53-57. Luo Z-X, Kielan-Jaworowska Z, Cifelli RL. 2002. In quest for a phylogeny of Mesozoic mammals. Acta Palaeontol Pol 47:1-78. Luo Z-X, Ji Q, Wible JR, Yuan C-X. 2003. An early Cretaceous tribosphenic mammal and metatherian evolution. Science 302:1934-1940. Macrini TE, Rowe TB. 2004. Cranial endocasts of monotremes. J Vertebr Paleontol 24(Suppl. No. 3):87A. Manger PR, Collins R, Pettigrew JD. 1997. Histological observations on presumed electroreceptors and mechanoreceptors in the beak of the long-beaked echidna, Zaglossus bruijnii. Proc R Soc Lond B 264:165-172. Meisami E, Bhatnagar KP. 1998. Structure and diversity in mammalian accessory olfactory bulb. Microsc Res Tech 43:476-499. Messer M, Weiss AS, Shaw DC, Westerman M. 1998. Evolution of the monotremes: phylogenetic relationship to marsupials and eutherians, and estimation of divergence dates based on ?-lactalbumin amino acid sequences. J Mammal Evol 5:95-105. Musser AM, Archer M. 1998. 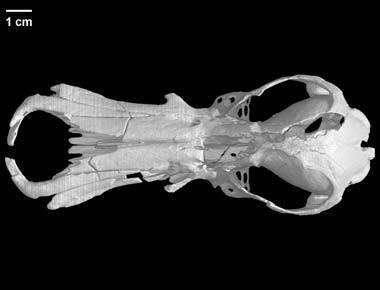 New information about the skull and dentary of the Miocene platypus Obdurodon dicksoni, and a discussion of ornithorhynchid relationships. Philosophic Trans R Soc Lond B 353:1063-1079. Northcutt RG. 1984. Evolution of the vertebrate central nervous system: patterns and processes. Am Zool 24:701-716. Northcutt RG. 1985. The brain and sense organs of the earliest vertebrates: reconstruction of a morphotype. In: Foreman RE, Gorbman A, Dodd JM, Olsson R, editors. Evolutionary biology of primitive fishes. New York: Plenum Press. p 81-112. Nowak RM. 1991. Walker’s mammals of the world. Volume 1. Fifth edition. Baltimore: The Johns Hopkins University Press. 642 p.
Pascual R, Archer M, Jaureguizar EO, Prado JL, Godthelp H, Hand SJ. 1992. First discovery of monotremes in South America. Nature 356:704-706. Pasitschniak-Arti M, Marinelli L. 1998. Ornithorhynchus anatinus. Mamm Species 585:1-9. Paulli S. 1900. Über die Pneumacität des Schädels bei den Säugetieren. I. Über den Bau des Siebbeins. Über die Morphologie des Siebbeins und die Pneumacität bei den Monotremen und den Marsupialiern. Gegenbaurs Morphologisches Jahrbuch 28:147-178. Pirlot P, Nelson J. 1978. Volumetric analysis of monotreme brains. Aust Zool 20:171-179. Proske U, Gregory JE, Iggo A. 1998. Sensory receptors in monotremes. Philosophic Trans R Soc Lond B 353:1187-1198. Rauhut OWM, Martin T, Ortiz-Jaureguizar E, Puerta P. 2002. A Jurassic mammal from South America. Nature 416:165-168. Ross CF, Henneberg M, Ravosa MJ, Richard S. 2004. Curvilinear, geometric and phylogenetic modeling of basicranial flexion: is it adaptive, is it constrained? J Hum Evol 46:185-213. Rowe T. 1986. Osteological diagnosis of Mammalia, L. 1758, and its relationship to extinct Synapsida. PhD dissertation, University of California, Berkeley. 446 p.
Rowe T. 1996a. Brain heterochrony and origin of the mammalian middle ear. In: Ghiselin M, Pinna G, editors. New perspectives on the history of Life. San Francisco: California Academy of Sciences, Memoir 20. p 71-95. Rowe T. 1996b. Coevolution of the mammalian middle ear and neocortex. Science 273:651-654. Rowe T, Carlson W, Bottorff W. 1995. Thrinaxodon: Digital atlas of the skull. CD-ROM (Second Edition, for Windows and Macintosh platforms), Austin: University of Texas Press. Rowe TB, Eiting TP, Macrini TE, Ketcham RA. 2005. Organization of the olfactory and respiratory skeleton in the nose of the gray short-tailed opossum Monodelphis domestica. J Mammal Evol 12:303-336. Scheich H, Langner G, Tidemann C, Coles RB, Guppy A. 1986. Electroreception and electrolocation in platypus. Nature 319:401-402. Schlosser G. 2002. Development and evolution of lateral line placodes in amphibians. II. Evolutionary diversification. Zoology 105:177-193. Tykoski RS, Rowe TB, Ketcham RA, Colbert MW. 2002. Calsoyasuchus valliceps, a new crocodyliform from the early Jurassic Kayenta Formation of Arizona. J Vertebr Paleontol 22:593-611. Wible JR, Rougier GW. 2000. Cranial anatomy of Kryptobaatar dashzevegi (Mammalia, Multituberculata), and its bearing on the evolution of mammalian characters. Bull Am Mus Nat Hist 247:1-120. Wible JR. 2003. On the cranial osteology of the short-tailed opossum Monodelphis brevicaudata (Didelphidae, Marsupialia). Ann Carneg Mus 72:137-202. Witmer LM, Chatterjee S, Franzosa J, Rowe T. 2003. Neuroanatomy of flying reptiles and implications for flight, posture and behaviour. Nature 425:950-953. Zeller U. 1988. The lamina cribrosa of Ornithorhynchus (Monotremata, Mammalia). Anat Embryol 178:513-519. Zeller U. 1989a. Die Entwicklung und Morphologie des Schädels von Ornithorhynchus anatinus (Mammalia: Prototheria: Monotremata). Abh d senck naturf Ges 545:1-188. Zeller U. 1989b. The braincase of Ornithorhynchus. Fortschr Zool 35:386-391. Click on the thumbnail to the left for a pitch animation (1.6 mb) of the Obdurodon cranial endocast highlighted in red within the skull, which is rendered semi-transparent. Click on the thumbnail to the left for a pitch animation (2.2 mb) of the isolated Obdurodon cranial endocast. Click on the thumbnail to the left for a roll animation (2.1 mb) of the Obdurodon cranial endocast highlighted in red within the skull, which is rendered semi-transparent. Click on the thumbnail to the left for a roll animation (2.1 mb) of the isolated Obdurodon cranial endocast. To cite this page: Dr. Ted Macrini, Dr. Timothy Rowe, Dr. Michael Archer, 2006, "Obdurodon dicksoni" (On-line), Digital Morphology. Accessed April 19, 2019 at http://digimorph.org/specimens/Obdurodon_dicksoni/.